My Cantonese right now – often I'll understand something in Cantonese, with no translation. Sometimes, I'll come across a sentence that's grammatically different and I'll need to translate it in my head in order to make sense of it. This dies away over time, as I improve. Olly Richards: Good morning everybody, and welcome back to the I Will Teach You a Language podcast. It is the morning, it is about eight o’clock and I am recording this in the morning. I am just about to get on the train and go up to Milton Keynes, which is a town here in the UK and it is very exciting because I am going to visit the Open University because we are working together on a brand new open course. Now open courses are very popular at the moment, and there are lots of universities around the world that are creating these massive open online courses which are university level courses that are open to the public and free for everybody. So we are making one on how to learn a new language, and it is super exciting because it is going to be available for free to everybody and hopefully I am going to be able to reach a lot of people doing this and help a lot of people with their language learning. And hopefully get a lot of people involved in learning a language for the first time. So we have our first meeting today and we are going to be brainstorming, flushing out the course, deciding what we are going to be doing, super exciting. 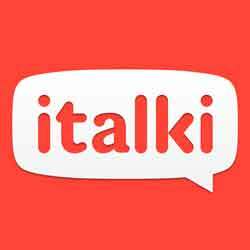 I would like to thank the sponsors of the show, iTalki, and if you are looking a native speaker teacher to help you get a bit more speaking practice in the language you are learning iTalki is the best place to do it. I strongly recommend them, and I use them myself every week. If you would like to get a free lesson you can go to www.Iwillteachyoualanguage.com/FreeLesson. Okay, let’s get into today’s question from Arnie. Arnie: Hey Ollie my name is Arnie from the United States. I am studying French and have been for about seven months. Even though I haven’t taken a formal exam, I gauge them somewhere between the A2 or B1 level. My issue comes with I have a tendency to translate things in my head once someone is talking to me. For example when I talk to you or if I am watching a movie or listening to the radio, the speaker is saying something I am still translating in my head. But while I am doing that the speaker continues to talk and I have missed the dialogue which is really an issue when I am in the car listening to the radio. So any help you can give me to stop doing that would be appreciated, and keep up the good work, thank you. Olly Richards: Hey Arnie, thank you very much for your question. Great to hear from you, and good job on getting to where you have with French as well. This question of translating, everybody goes through this, it is totally normal and I have got to say, I am not going to be able to give you a quick fix today, I guess you probably knew that already, but hopefully I can guide you in the right direction and let you know what to expect. I have actually answered exactly the same question before, in episode 87. So if you want you can go back and check out that different perspective, or maybe even the same perspective. That is at www.Iwillteachyoualanguage.com/Episode87. But I find that it is interesting to come back to these questions more than once because my own thinking and my own experience changes over time. I might have answered this question a year ago, I am a different language learner now, a better language learner hopefully, probably a better teacher as well, so I don’t mind these questions coming up and I am really happy to try and answer this for you. So as I said there is no quick fix to this, it does take time, but this is one of the advantages I think of – this is where I feel my perspective can be really valuable because having been through this language learning process so many times, you start to just notice paths and you know what to expect, right. So, let’s just start by stating the obvious because often these questions can be quite emotional, right, but let’s get things in perspective. Arnie, when you understand what is being said in French, when you listen to something and you understand it, you have no reason to translate, right? If some someone says to you, “Bonjour” you don’t translate that, you know what it means. So on a very simple level, the more your French improves the less you translate, okay. Now, yes, it is stating the obvious, but it is good to remember, because it helps you realise it is a gradual process. Now it can be helpful in this case to break down the language learning thing into two different parts, vocabulary and grammar. Now for me, this translating in your head issue is almost always a grammar problem, because if there is a word I don’t know, well it’s very simple, very clear what the problem is, I don’t know that word. So I am going to be stuck, so one of the things that needs to be said here is that you need to keep always working on your vocabulary and growing your vocabulary because if you don’t know what a word is that is always going to cause you problems. So the translating issue itself is more of a grammar thing, French grammar is different from English grammar. Things are said in different ways, and so that is where translation usually becomes a problem, right, so you are listening to something maybe you understand the words but you just can’t quite make sense of it. I am thinking about my Cantonese right now. I find that often when I am listening to Cantonese I will understand something that is being said in Cantonese with no translation necessary, and it is like so cool when that happens and you understand something you don’t need to translate, you just know what it is. But then sometimes I will come across a sentence that is maybe grammatically different but it might be quite a simple sentence but it is grammatically different and I will have to translate it in my head in order to make sense of it, right. So if I had an example in Cantonese might be if you are talking about – like if I am talking about my recent trip to Hong Kong, I might say [foreign] which means like now I understand more [foreign] and this is quite a simple sentence in Cantonese but it sounds – it is very weird in English, because literally with these three words you are saying “understand more did”, all right, “understand more did”, makes perfect sense in Cantonese or with Chinese grammar, but I remember the first time I heard that, I was like, “Eh, what?” I understand the words but what are you saying here. But you see now that I understand that, that point, I don’t need to translate anymore because I just got used to it, right, so the need to translate dies away over time as I improve in the language. It is important to remember that Arnie, because often I find that people blame themselves and they say oh what is wrong with me for translating. Listen, translation is inevitable, it will happen, so the more that actually you can become comfortable and accept the fact that you are translating the less stressful it is going to be for you. Let’s talk about some practical things you can do to improve. All right, so some key point first. Spend more time listening and reading. Now you are already listening to the radio and watching movies, that is great. Personally I don’t find those two activities helpful because they are too hard at an A2 B1 level. So instead, find material that comes with a transcript and listen and read at the same time. I am working – this is such a big problem and I am actually working on a solution to that right now which I have mentioned before. It is my new conversations product with extensive dialogues in French and different languages at different proficiency levels with transcripts and word lists and everything you need, so I am working on solving this problem for you Arnie, but it will be a little bit of time in coming. You need to spend more time listening and reading in a more focussed way. You know, it is not enough I don’t think just to sit in the car and listen to French. The gap is too big between where you are and what you are listening to. So you need to find more appropriate material that is easier to study with. Second thing is keep growing your vocabulary, I mentioned this earlier on. It is so important you don’t leave vocabulary to chance you need to work at it because the more words you know the easier everything is going to be. Next thing is start using mono-lingual dictionaries if you can. You are at the level Arnie where you can understand a fair bit in French, so rather than looking up the translation, use a mono-lingual dictionary so you look up the word in French and you get the explanation in French. It just helps you get more used to the language. Also start doing more of your daily activities in French, Google searches, looking for recipes, things like that. Do more stuff in general in French and it will just help you get used to the language. Now on a deeper level, there are other things that you can start to do, different approaches to studying that will help. So when you are studying and you come across a new grammar point perhaps, try not to focus so much on the conjugation of the individual verb and all that detail. Try to focus on the grammar patterns, so how does the whole sentence play out. How does grammar work on the level of the sentence, and then you can play around with this, so rather than say for example if it was raining I would have stayed at home. You could say if it was sunny I would have stayed at home. If it was sunny I would have gone out. Practice making these variations to yourself and that helps you stop looking at the micro and start looking at the macro, if that makes sense. Hopefully it does. It is very easy with French grammar in particular to get hung up on individual verbs and conjugations, that is important but it also stops you paying attention to the broader meaning. When you are dealing with new grammar, try to get into the head of the native speaker. So when you are looking at a sentence try not to focus on okay how does this work mechanically, how does this translate into English. What I like to do is kind of sit and look at a sentence and try to feel and notice the way that an idea is being expressed, the kind of attitude or the feeling. The example I gave earlier in Cantonese of [foreign] like I am saying I understand more now, but this is a classic example of how in the Chinese language ideas are expressed very bluntly and very succinctly, and so by looking and paying attention to the direct way in which that idea is expressed in Cantonese, that helps me just embody a little bit more the attitude of the language, the attitude of the speaker, and that is going to help you much more when it comes to listening, interpret what is being said. I know that is kind of a very vague piece of advice but it is also extremely powerful if you can shift your thinking in that way. And on a more general point, when you are – whether you are learning vocabulary or using flash cards or whatever, move away from the single word and start working with full sentences. So when I use my flash cards for example, I always use full sentences in there because again the more that you can get used to larger units of language in your studying, the easier it is going to be to understand what is being said and to gradually stop translating. So I hope those, something in there was helpful Arnie. Again it is very difficult to give you a quick fix, so maybe go through these points I have mentioned and just think about how you can adapt your approach to studying in a way that is going to give you the best chance of improving over the long term. All of these notes that I have made are in the Show Notes. You have got them in bullet points for quick reference. You have also got the full transcript if you want to read through that. You can find that at www.Iwillteachyoualanguage.com/Episode167. Now today I am going to leave with you a quote, and in fact it is the same quote from Episode 87, the last time I answered that question. And I am giving it to you again because it is such gold and it is so important to remember. And it comes from Katsumoto from all Japanese all the time, and he said “You don’t learn a language, you get used to it”. Thank you very much for listening, and I will see you in the next episode of the podcast.